I don't now if you had this experience as a teenager, but when I was one (many many years ago), we "hung on the corner" in Philly. That is what we did. We left the house and went to the corner to hang out with friends and get in trouble doing stupid teenaged things like smoking cigarettes or trying to get someone's older brother to get us some beer. Dumb waste of time when I think about it now - I could have been birding! This weekend, I reminisced about hangin' on the corner and actually did it again. This time, I wasn't in Philly. On Saturday, it was just me and Roxy trying to be cool standing on the corner in the rain. Sunday, I was joined by a guy from up north looking for his 300th bird of the year and Kate, another Philly birder that I know, (check out her blog - http://birdingphilly.wordpress.com/), and 30+ MPH wind. We all hung on the corner today - no smokes and no beer. Just a "gang" with binoculars. We stood there and stood there. Truth be told, it was so windy that I spent alot of time sitting in the car staring at the corner. The bird that we were waiting for finally showed up about 10:30 today and gave us a nice show. 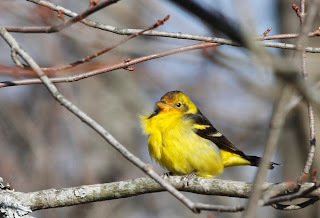 This bird is a Western Tanager which is a bird of western North America. It rarely comes east of the Rocky Mountains. This bird has been hanging on the same corner in Cape May Court House for a few weeks now but I haven't been down to see it yet. Boy, I'm glad I made time for it this weekend. The Western Tanager is a ray of sunshine in the middle of gray winter. Look at this guy. 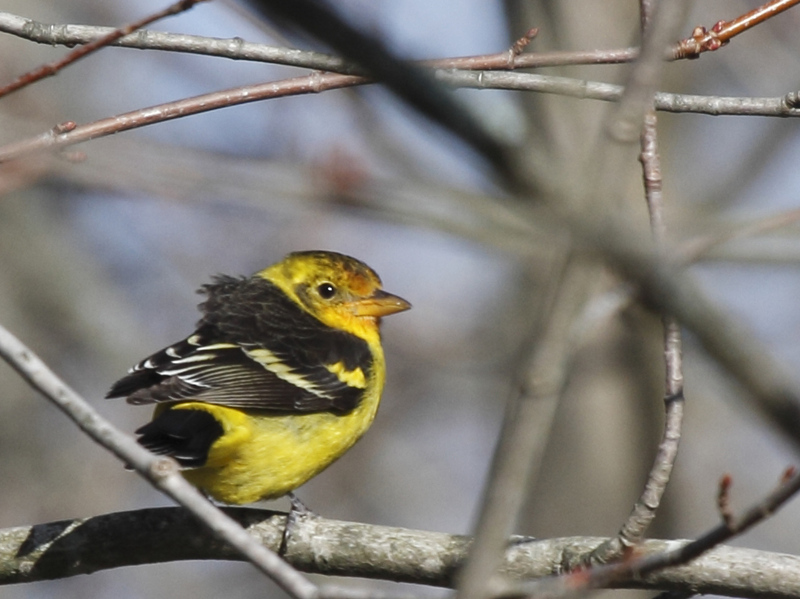 I also reminisced this weekend about the first time I saw a Western Tanager. We were hiking along a ridge in Yellowstone National Park 20 years ago. Connie and Di forged ahead. I was lagging slightly behind. Nonna, was lagging even further behind. Suddenly, Nonna starts yelling - "Lin, Lin, Lin, come look at this, come look at this, come look at this bird!" I went back and saw one of those. My jaw dropped. Awesome. Thanks Nonna for making me turn back 20 years ago. And Thanks to Kate and Alan for hangin' on the corner with me today. P.S. - notice how the bird's feathers are blowing in both photos? That is how windy it was today. Linda...You and Connie can hang on our corner (all four) anytime! We might even hang with you!